Pflueger’s life and work: Theresa Poletti, Art Deco San Francisco: The Architecture of Timothy Pflueger, Princeton Architectural Press, 2008 (book). El Rey Theater, landmark designation statement from Planning Dept (PDF). Deep history, with background on Timothy Pflueger. More about the Telephone Building on artandarchiecture-sf.com. The renovation of the Telephone Building on SF Chronicle. Rare video from the GGIE “Art in Action” program, artists at work. 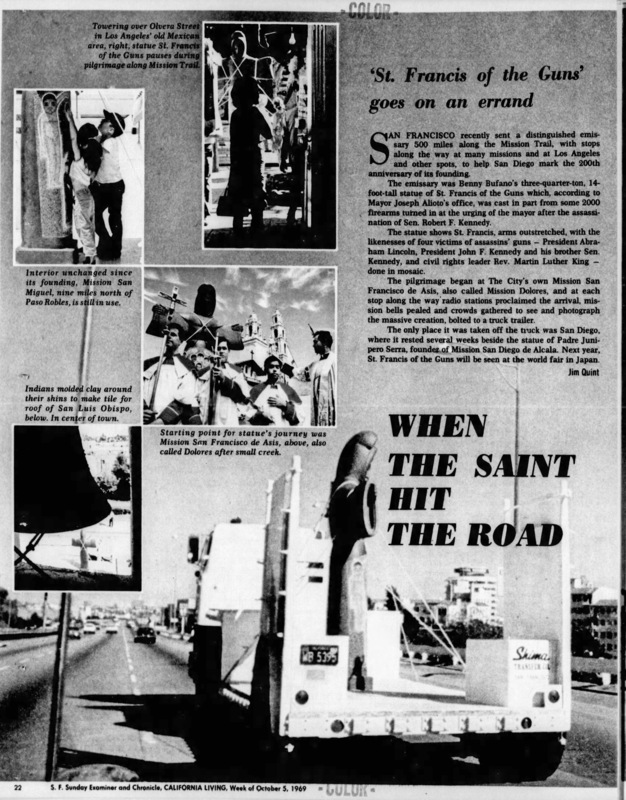 “When the Saint hit the Road” SF Examiner, 5 Oct 1969 (image file of newspaper). 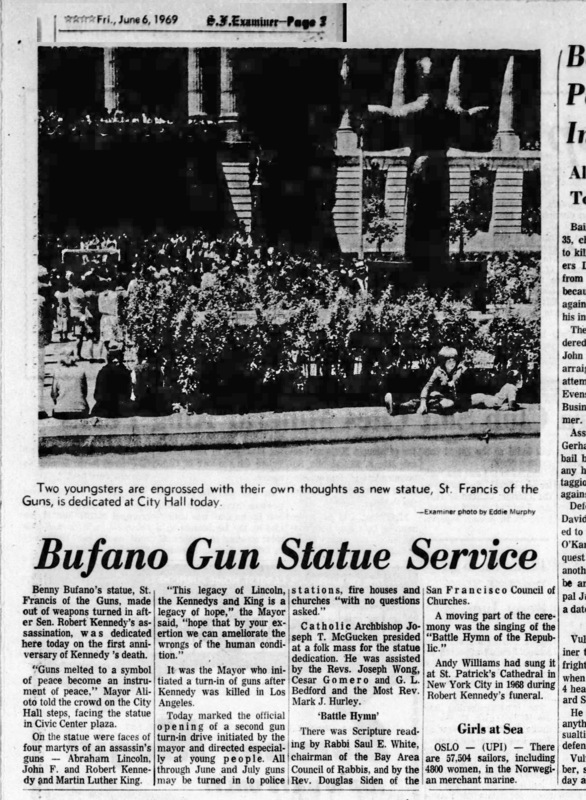 Dedication at City Hall: “Bufano Gun Statue Service” SF Examiner 6 June 1969 (image file of newspaper). Wareham’s Recology work on Flickr. The Guardian: “124-year-old statue reviled by Native Americans – and how it came down” Early Days statue removed from Civic Center. Some of Sargent Johnson’s local work on artandarchitecture-sf.com. Includes account of the “log” discovered in 2015 and now in the hands of the SF Arts Commission. Tommy Lott, “Black Consciousness in the Art of Sargent Johnson,” in Reclaiming San Francisco: History, Politics, Culture, James Brook, Chris Carlsson, and Nancy J Peters, City Lights Books, 1998 (book). SFMoMA page with images of Johnson’s work. Pacifica by Ralph Stackpole on Wikipedia. Feature on the Olmec head in the Guardsman, City College’s newspaper. The Diego Rivera mural: Pan-American Unity or “Marriage of the Artistic Expression of the North and the South of on this Continent” (Pan-American Unity). City College of San Francisco, on Living New Deal, an excellent website about New Deal art and other projects. Pauline Teller, one of the women of the GGIE not asked by Timothy Pflueger to create work for CCSF, in a recent CCSF exhibition. An online art tour of CCSF, to share with friends–though if you have taken our art walk, you know much more than is contained in this brief summary!